October 2018 marks 30 years since Matilda was published! 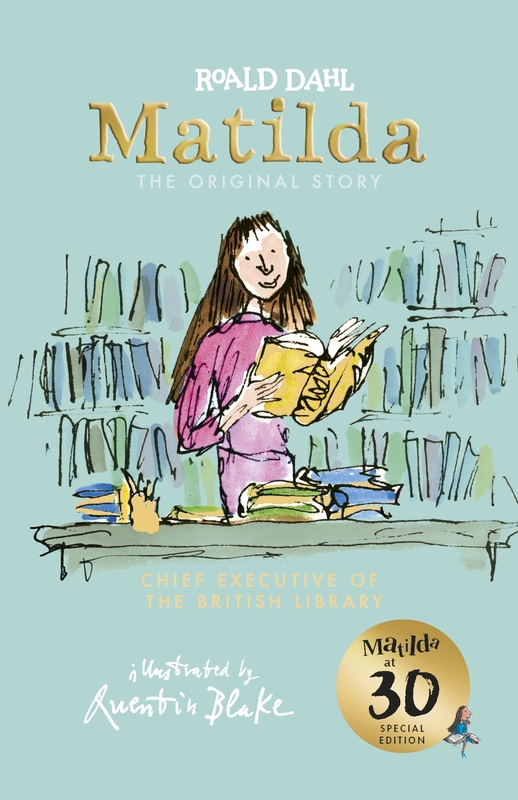 This brand new jacket comes with a never-before-seen illustration of Matilda as the Chief Executive of the British Library - one of the careers that Quentin Blake himself has imagined that Matilda might have at 30 years old. Discover the other jackets in this special 30th anniversary collection: Matilda as a world traveller and Matilda as an astrophysicist. Roald Dahl (1916-1990) was born in Llandaff, South Wales, and went to Repton School in England. His parents were Norwegian, so holidays were spent in Norway. As he explains in Boy, he turned down the idea of university in favour of a job that would take him to ‘a wonderful faraway place’. In 1933 he joined the Shell Company, which sent him to Mombasa in East Africa. When World War II began in 1939 he became a fighter pilot and in 1942 was made assistant air attaché in Washington, where he started to write short stories. His first major success as a writer for children was in 1964. Thereafter his children’s books brought him increasing popularity, and when he died children mourned the world over, particularly in Britain where he had lived for many years.